MukhaLepa is the application of an herbal paste (suitable for all skin types) to the face. For centuries Mukha Lepa has been used as a beauty ritual for Indian women. Traditional herbs are used to cleanse, exfoliate, tone and finally hydrate. 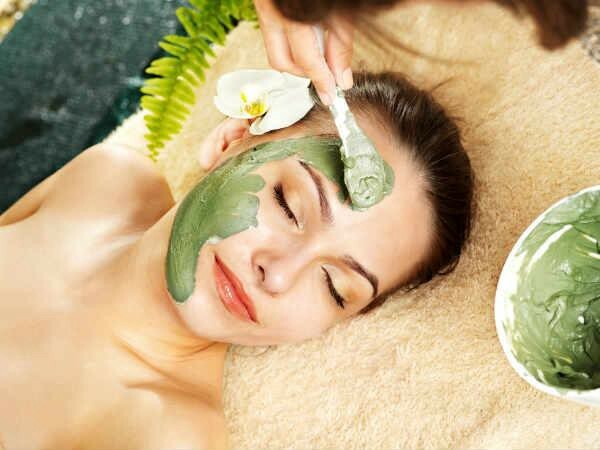 A specialised dosha specific herbal lepa or mask is applied to the face to bring out the beauty within n common terms we can call it a deep cleansing and skin refining Ayurvedic facial. The face pack which are mentioned in ayurveda help women to get rid of wrinkles , dark circles, pimples and acne. Herbal face packs increase the fairness and smoothness of skin. We can derive the maximum benefits of herbal face packs by using them according to our skin type. These face packs increase skin glow and are best ayurveda treatment to increase fairness. Mukhlepam, a type of Ayurvedic facial strives to bring glow and radiance to the face. It is also known as an anti-aging medium for the facial skin. Apart from this, it also de-tans skin and brings back the natural glow. It is just like a regular facial but the products used are completely natural and ayurvedic. So, if you want a younger looking skin without using any chemicals, this facial is for you! Removes impurities, unclogs pores and helps in reducing acne, blemishes, pimples and dark circles around the eye. It clears hyper-pigmentation, provides lustre and helps to improve complexion of the face. This ayurvedic facial is recommended to be carried out once in 2 weeks or at least once a month. Its effects are long-term for skin so one can invest in it. Nourishes the skin & supply essential nutrients to skin.